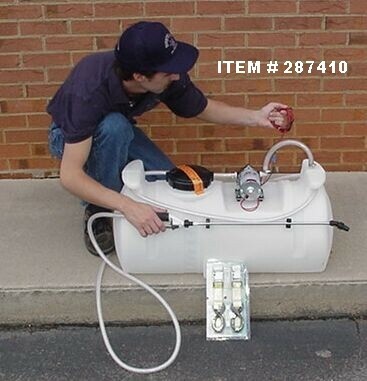 SPRAYER DESCRIPTION: This is our Electric 16 gallon Power Sprayer which is ideal for outside jobs like termite applications and landscape treatments. 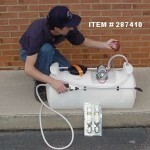 It features a Shurflo pump which runs on 12 volts and can pump up to 2.2 gallons per minute. 12 volt electric sprayer.. How far can this sprayer spray? It will reach out 15 feet adequately. After that the spray pattern gets diffused and spread out making it inefficient much past this distance. With that being said, it can obtain heights of 20 feet under certain conditions. But its definitely not designed for spraying "up". Its more for use at ground level, around the home and garden and ideally suited for areas 1 acre or less.